Aerospace Floor Panels Market Share « Global Market Insights, Inc. Rapidly increasing air traffic resulting from worldwide expansion of the aviation sector has propelled the aerospace floor panels market with key manufactures speeding up the production of commercial aircrafts. Constituting a major portion of any aircraft’s weight, floor panels need to be light for reducing the overall mass and also should be durable to tolerate the brunt of thousands of passengers or tons of cargo load over a period of time. The introduction of efficient materials and designs to manufacture lightweight panels and structures has supplemented cost savings for airlines along with meeting stringent norms mandated by aviation authorities. As such, the aerospace floor panels market has hugely transformed due to consistent focus on enhancing the quality of panels, which form an integral component of the all-round safety within the aircraft. Speaking of efficient panels, a prominent design that has critically altered the aerospace floor panels industry is the honeycomb sandwich assembly, which has allowed the production of lighter and highly durable floor paneling. Applicable in a variety of segments such as railways, marine, construction and energy, the honeycomb sandwich design offers exceptional strength-to-weight ratio and panels can be modified according to the type of use. In terms of improving interior aesthetics of an aircraft, the surfaces of these panels can be customized depending on the face sheet material. With the use of high-quality honeycomb sandwich panels to ensure a strong floor base, the global aerospace floor panels market surpassed a revenue of USD 174 million in 2017. Aluminium honeycomb panels, in particular, are increasingly being utilized in aircraft production and demand for these panels is expected to rise steadily over the next few years. In terms of feasibility, Aluminium offers remarkable strength-to-weight properties to floor panel designers along with flexibility and considerably low processing cost, as compared to other robust materials like Titanium. Other notable features of Aluminium are corrosion resistance, easy to machine and cut as per required specifications and the ability to enhance the durability of structural components. Since the alloy is also described as being almost 90% recyclable, Aluminium honeycomb sandwich panels are expected to become immensely popular in the aerospace floor panels market. Major aircraft manufacturers are already treading in the direction of adopting aluminium honeycomb cores in flooring to reduce the structural weight and cost of production. Interesting predictions regarding growth of the aircraft segment has evidently spurred the development of the aerospace floor panels industry. Recently, the American multinational airplane maker Boeing released a statement in which it mentioned that the aircraft industry has been witnessing a prolific growth trend over the past eight years. The company also revealed certain estimates, according to which the global demand for new passenger jets will reach approx. 42,730 by 2037. The total value of these new planes is projected to be around USD 6.3 trillion, indicating the massive earning potential of the aerospace floor panels market from new aircraft production. Boeing attributes the growing demand to the continuous economic growth worldwide and the rising consumer spending, especially by the working middle class population. Expansion of the tourism sector has additionally boosted air traffic in emerging economies, strengthening the aerospace floor panels industry stance. Besides the passenger segment, use of cargo planes for transporting heavy commercial or military equipment and to undertake product delivery between multiple countries has grown tremendously due to progressive pricing trends. As a result, not only new cargo-carrying aircrafts are being made but old and new commercial jet builds are also being converted to freight planes, signifying a lucrative emerging avenue for the aerospace floor panels market. For instance, Dresden-based Elbe Flugzeugwerke (EFW), a joint venture between Airbus and Singapore Technologies (ST) Engineering’s Aerospace arm, is involved with converting passenger jet to freight aircrafts. In August 2018, EFW delivered an Airbus A330-200 Passenger-to-Freighter converted plane to EgyptAir Cargo, while reports indicate that EFW has further contracts in the pipeline to convert ten A321-200s for lessor Vallair. As cargo freighters need to be light for traversing large distances with heavy loads, sturdy flooring and lighter frame is essential for guaranteeing safe transportation and better fuel-efficiency. With projects like EFW, production of floor panels suitable for commercial logistics will see tremendous increase and substantially bolster the aerospace floor panels industry. 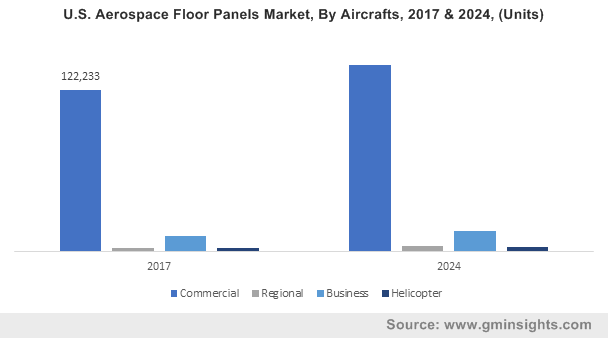 Anticipated to register a 4% CAGR from 2018 to 2024, the aerospace floor panels market is spearheaded by companies like EFW, The Gill Corp., Rockwell Collins, Zodiac Aerospace, Nordam Group, Euro Composites and Avcorp Corporation. This entry was posted in Automotive & Transportation and tagged Aerospace Floor Panels Market, Aerospace Floor Panels Market Analysis, Aerospace Floor Panels Market Research, Aerospace Floor Panels Market Share, Aerospace Floor Panels Market Size, Aftermarket, Aircraft, Aluminum Honeycomb, Business Jet, Commercial Aircraft, Distribution Channel, Helicopter, Nomex Honeycomb, OEM, Raw Material, Regional Jet.